We are dealing in Khoya Making Machine. Below are the models available and the quantity which we can provide. 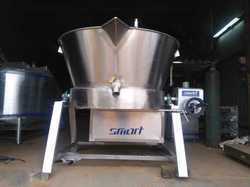 Khoya Making Machine specializes in food processing. From past many years, we are engaged in offering excellent range of Khoya Making Machine for Dairy to our customer. Moreover, client can get the offered products products from us at very economical prices. With our years of experience & in-depth knowledge in this field, we are engaged in offering a quality-assured array of Gas Operated Khoya Making Machine. Coagulation of milk: at 85 degree C.
Khoya Machine is used for Extracting Khoya or Mawa from Milk. The Milk is heating in the Milk Pan using Diesel of Gas Burner placed below the Milk Pan. The Milk Pan rotates in circular motion clockwise and the Mawa or Khoya gets separated from Hot Milk slowly.It can be used with Singls phase Power supply and need only 1.5 hp to 2 HP power. The Capacity ranges from 30kg- 50kg Mawa or Khoya. The Automatic Mawa Machine is a uniquely designed mawa maker for large scale sweet shops. It is an energy effcient appliance that is an ideal alternative to fossil fuels such as Gas and Diesel. A perfect solution for Mawa making, Basudi as well as and Milk boiling preparations. With an impressive growth record in this highly competitive industry, we are providing a qualitative range of Diesel Model Khoya Machine. The main motive of this product is to make khoya in the most hygienic way and has been labeled as being the best. They are usually seen in occasions and are intricately made.